SMS Seydlitz with a "Zeppelin"[?] or "SL airships"[?]. Schütte-Lanz (SL) is the name of a series of rigid airships designed and built by the Luftschiffbau Schütte-Lanz company from 1909 until 1917. One research and four passenger airships were planned for post-war use, but were never built. The Schütte-Lanz company was an early competitor of the more famous airships built by Ferdinand von Zeppelin. Although it is common for all rigid airships to be informally called zeppelins regardless of their manufacturer, this name technically only applies to those manufactured by the Zeppelin company. When the Zeppelin LZ 4 met with disaster at Echterdingen in 1908, Professor Johann Schütte started to consider the problems of airship design. He decided, with the co-operation of his students, to develop his own scientifically designed, high performance airship. In partnership with Dr Karl Lanz, an industrialist and wood products manufacturer, he started constructing the Schütte-Lanz Luftschiffbau on 22 April 1909. The airships were successful at first, and introduced a number of highly successful innovations. The decision was made to compensate the company for the unusable wooden ships, and in response the company started work on a tubular aluminum-framed ship which was probably not completed. The German Navy had bases closer to the sea, and thus more humid. They were reluctant to accept wooden composite craft. As a result, the primary customer for Schütte-Lanz airships was the German Army. The German Army decided well before the German Navy that airship operations were futile in the face of land-based heavier-than-air opposition. Twenty-four Schütte-Lanz airships were designed before the end of the World War I, most of which the company was not paid for due to the collapse of the German Monarchy. By the time the last eight ships were ready, most of them could not be operated due to the loss of trained crews. There are also political-economic factors to the failure of the company, which have yet to be fully researched. There is certainly evidence for a pro-Zeppelin lobby in the German military and government that wanted to exclude all other airship manufacturers, regardless of what superior technical innovations they proposed. In the postwar period, Professor[verification needed] Lanz designed a series of very large advanced airships for trans-Atlantic and trans-Pacific passenger operations (described below), as well as proposals for the US Navy’s rigid airships ZRS-4 and ZRS-5. However none of these were ever realized due to Allied objections. The Schütte-Lanz airship SL1 was the first of 20 airships built by the company. Construction was carried out in a large hangar at Rheinau near Mannheim. The ship was powered by four 125 hp (127 PS; 93 kW) Daimler-Benz engines installed in two ventral gondolas. A distinctive feature of the Schütte-Lanz ships was that the frame was constructed from special plywood which was (supposedly) waterproofed and protected from frost. The S.L.1 was constructed with a diamond lattice frame and had a highly streamlined shape, allowing it to achieve a record speed of 38.3 km/h (23.8 mph; 20.7 kn). The structure of the S.L.1 resembles the later "geodesic" structures of Barnes Wallis at Vickers or Buckminster Fuller's domes. It was only matched at the time by the structure of the MacMeecham airship, designed and partially built in England in the first years of World War I. Fifty-three experimental flights were made between October 1911 and December 1912, the longest of over 16 hours. The ship was handed over to the German Army on 12 December 1912 but destroyed soon afterwards when it broke loose from its temporary mooring during a storm. Schütte Lanz S.L.2 bombing Warsaw in 1914. The Schütte-Lanz airship SL2 surpassed the contemporary Zeppelin airships in performance. It adopted the Zeppelin ring-girder construction method, but retained the streamlined shape and plywood construction of the SL1. The SL2 was also the most significant airship to date in that it laid down two vital design innovations that were copied in almost all subsequent rigid airships. The first was the cruciform tail plane, with a single pair of rudders and elevators. The second was the location of the engines in separate streamlined gondolas or cars. A third innovation, for war service, was the mounting of heavy machine guns for defense against attacking aircraft in each of the engine cars. SL2 was built between January and May 1914 and transferred to Austrian military control as the S.L.II. It carried out six missions in the first year of the war over Poland and France. After being enlarged in summer 1915, several more missions were carried out before SL2 was stranded at Luckenwalde on 10 January 1916 after running out of fuel and decommissioned. The SL2 was a perfect example why the advanced technology of Schütte-Lanz, and the advantages of wood in compression as opposed to tension allowed the Schütte-Lanz type of airship to be technically superior until a certain size had been reached. Naval airship based at Seddin which flew 30 reconnaissance missions and one bombing mission over England. The highlight of S.L.3's career was its attack on the British submarine E4 on 24 September 1915. The structure of the ship degraded because of atmospheric exposure and the ship was stranded near Riga on 1 May 1916. Naval airship based at Seddin. S.L.4 flew 21 reconnaissance missions and two bombing raids against enemy harbours on the Eastern front. It was destroyed on 14 December 1915 after its hangar collapsed due to snow accumulation on the roof. Naval airship based at Seddin. Flew six reconnaissance missions, but exploded due to unknown causes with the loss of all hands while taking off on 10 November 1915. Army airship based at Königsberg. Carried out three reconnaissance missions and three bombing raids before suffering structural failure. Repaired and possibly enlarged before being decommissioned 6 March 1917 when the army terminated airship operations. Naval airship based at Seddin. Carried out 34 reconnaissance missions and three bombing raids, carrying 4,000 kg of bombs each mission. Held the record for the greatest number of combat missions of any Schütte-Lanz airship. Decommissioned due to age 20 November 1917. Naval airship based at Seddin. Carried out 13 reconnaissance missions and four bombing raids carrying 4,230 kg (9,330 lb) of bombs each mission. Crashed in Baltic, possibly after lightning strike on 30 March 1917. Army airship based at Yambol, Bulgaria. Carried out a 16-hour reconnaissance mission. Disappeared during a subsequent attack on Sevastopol, possibly due to bad weather 28 July 1916. Army airship based at Spich. Commanded by Hauptmann Wilhelm Schramm. 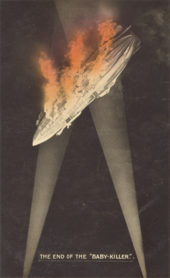 The first German airship to be shot down over Britain; it was attacked over Hertfordshire by Lt. W.L. Robinson in a BE 2C with incendiary ammunition on 3 September 1916. It crashed at Cuffley, having bombed Saint Albans. The crew were buried at Potters Bar Cemetery: and in 1962 they were re-interred at Cannock Chase German war cemetery. Army airship based at Leipzig. Considered unfit for combat duty and used for training only. Badly damaged when hangar collapsed because of heavy snow and stricken 8 February 1917. Navy airship based at Seerappen and Wainoden. Carried out two reconnaissance missions and two bombing raids. A later attack on Riga was abandoned because of engine failure. Rebuilt February 1917 but later damaged before finally being scrapped on 18 May 1917. Construction completed at Leipzig base, but ship destroyed by hangar collapse on 8 February 1917. Never built due to lack of space at Leipzig base, due to hangar collapse on 8 February 1917. Navy ship based at Ahlhorn. Burnt in huge hangar explosion and fire with four zeppelin airships on 5 January 1918 after only two missions. Never commissioned. Second Schütte-Lanz ship with tubular aluminium frame. May have been completed after war, but no further details. After the war, Schütte-Lanz came up with several peacetime airship projects which were never realised. Based on the metal framed S.L.23 and S.L.24, the first was the S.L.101. This was intended for a regular transatlantic service to New York or South America. Schütte-Lanz submitted an unsuccessful design to the U.S. Navy in 1926 in competition with the successful Goodyear-Zeppelin designs, USS Akron (ZRS-4) and USS Macon (ZRS-5). Wikimedia Commons has media related to Schütte-Lanz. ^ Brooks, Peter W. (1991). Zeppelin:rigid airships 1893-1940. London: Putnam Aeronautical. ISBN 0851778453. ^ Lueger 1920, pp. 404-412, Figs. 4-6, Luftschiff, Translation: "Five engine gondolas (one fore under, two aft adjacent under, two middle higher whereby one is obscured by the hull the other lies in front of the hull), each with a 240 PS Maybach engine"
Manfred Griehl; Joachim Dressel (1990). Zeppelin! The German Airship Story. ISBN 1-85409-045-3. Lueger, Otto (1920). Lexikon der gesamten Technik und ihrer Hilfswissenschaften (digital scan)|format= requires |url= (help) (in German). Bd. 1. Stuttgart, Leipzig. Lord Ventry; Eugene Kolesnik (1976). Jane's Pocket Book 7 - Airship Development. ISBN 0-356-04656-7. Lord Ventry; Eugene Kolesnik (1982). Airship Saga. ISBN 0-7137-1001-2. Reid, A. (2014). Schütte-Lanz Airship Design. Lulu. Wentzler, Sebastian (2000). Die Schütte-Lanz Innovation (PDF)|format= requires |url= (help) (in German). ISBN 3-8142-0718-1. This page was last edited on 9 January 2019, at 03:08 (UTC).